Fifth times a charm... that's how it goes right? 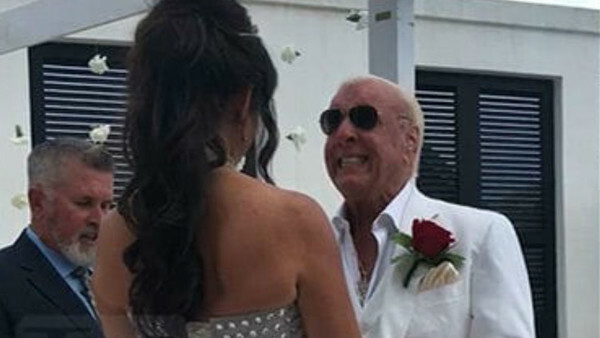 'The Nature Boy' Ric Flair married for the fifth time on Wednesday, typing the knot with Wendy Barlow in what was said to be a low key ceremony in Florida. Formerly known as Fifi the Maid in WCW, Barlow has been the fiancee of Flair's for a long time now and the pair had been dating for six years. The ceremony was held at a resort in Northern Florida on Wednesday. While the event was fairly low key, both The Undertaker and WWE Raw Tag Team Champion Dolph Ziggler attended the wedding, with the latter even being the man to walk Wendy down the aisle. Flair, a two time WWE Hall of Famer, has endured a long and troubled past with marriages, having had four different shots that all ended with divorce (one of them lasting 12 years, and another 23 years). Between his dedication to professional wrestling and his seeming inability to differentiate his gimmick from his real life personality, Flair struggled for a long time trying to find 'the one'.